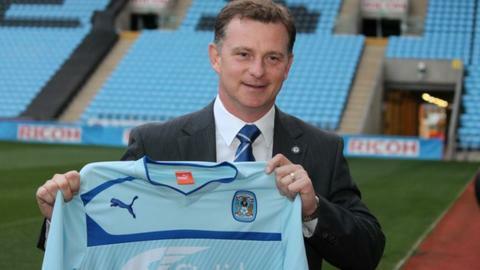 New Coventry City manager Mark Robins says his most important job is to get the Sky Blues supporters behind the struggling League One side. Robins was named manager on Wednesday with Coventry currently lying 23rd. "We need the supporters behind us," he told BBC Coventry & Warwickshire. "Without them you have nothing. "I feel for them. They've been through the mill. But let's not feel sorry for ourselves. Let's pick ourselves up and go again now." The Sky Blues are yet to win in seven league games this term. But as Robins approaches his first match in charge, against Carlisle United at the Ricoh Arena on Saturday, the 42-year-old former Manchester United striker said he felt very positive about the future and knew he needed to make a quick impact. "I've come for the long term," he said. "But I've got to do the right things in the short term to ensure that I remain there for the long term. "Possibly subliminally. You live through it and your experiences are what they are. No doubt I'll have picked things up along the way. But I'm me"
"There's a blame culture, in general, when you get into difficult situations. "We have to do the right things more often than not. The players have to take responsibility for their perfomances and not be looking round to blame each other." Robins also claims to have an open mind on the staff he has inherited, including assistant manager Richard Shaw and coach Lee Carsley, whose four league games in caretaker charge all ended in defeat. "Everybody's got a clean slate," said Robins. "I need to meet them and find out how they perform. "We'll do that over the next few days and weeks and see where we go. "But everyone needs to see how I work and be able to work in a way that aids our improvement and our way forward." After becoming the Sky Blues' 11th boss in as many years, Robins also knows where the buck stops following his meeting with Joy Seppala, chief executive of the club's owners SISU. "I was really impressed with her," he said. "She was excellent. She's very keen for the club to do well. "She laid her ideas down and I know in no uncertain terms exactly what is required and what is expected of me. "And I will work as hard as I possibly can and we will make sure that over a period of time we give the fans a team to be proud of."